With special permission, qualified candidates may also elect a General LL.M. with other self-designed specializations. Courses in the LL.M. programs are taught by a mixture of experienced full-time professors and leading practitioners who bring extensive real-world experience to very specialized areas of legal practice. Our programs are designed to provide each student with a background in the program areas most often encountered, while allowing each student to choose specialized courses according to his or her interest. Feel free to call the LL.M. Offices at (714) 628-2635, and you will be put into contact with a faculty member who can answer questions about the specific program that you are interested in. You may also dial 877-CHAPLAW, toll free from within the United States or email us at llm@chapman.edu. For foreign lawyers: Foreign students who have not studied or received a degree at either an English language law school or university must demonstrate proficiency through the Test of English as a Foreign Language (TOEFL) or the International English Language Testing System (IELTS). Please contact the LL.M. Programs Office for more information regarding scores. An applicant will only be admitted if the applicant's record, viewed as a whole, indicates that the applicant is likely to complete the program successfully. The applicant's academic record (at the undergraduate, graduate and law level) and relevant experience are the primary factors considered. At this time, all programs, with the exception of the LL.M. in Trial Advocacy, will accept applications for fall and spring admission. Admission is evaluated on a rolling basis. Early application submission will result in receiving a decision sooner. The priority deadline for admissions is June 30. Applications are reviewed on a rolling basis. Foreign lawyers are especially encouraged to submit their applications as early as possible, in order to ensure enough time for the processing of student F-1 visas. International students who do not possess a JD or LL.M. degree from an American law school will be required to take a course on Introduction to American Law, designed exclusively for LL.M. students and taught by the Director of Graduate Studies, supplemented by the participation of other Chapman faculty and staff. At the discretion of the LL.M. admissions committee, students also may be required to take courses in legal writing, legal and professional English, and/or legal research. Twenty-four (24) units of credit are required to obtain the LL.M. degree (27 units for LL.M. in Taxation). Full-time students may enroll in a minimum of nine (9) and a maximum of sixteen (16) units per semester. To receive financial aid, a student must be enrolled in a minimum of five (5) units per semester. Degree requirements must be completed within four (4) years. Each emphasis area requires completion of two or three required core courses. Introduction to American Law, a three credit course, is required of all foreign lawyers with a degree from a non-common law jurisdiction or law school. In addition, all LL.M. students are expected to complete a substantial writing project, and recommended to consider completing this requirement through Directed Research. Students also are strongly encouraged to pursue experiential learning opportunities, either through enrollment in an externship for credit (normally 3 to 5 cr. ), or through other volunteer or paid employment. In some circumstances, student may receive credits toward the LL.M. degree for courses taken before matriculation into the LL.M. Program, and for courses taken at another law school or in Chapman University Fowler School of Law's J.D. curriculum after matriculation into the Program. The grades in such courses are ignored in determining whether the student's grade point average satisfies the LL.M. degree requirements. A student may petition to receive up to six (6) credits toward the degree for certain LL.M. level courses or advanced J.D. level courses taken at any ABA-accredited law school during the three academic years preceding matriculation into the Program and within five years of completing the Program, provided in the case of each course that (1) the course is determined to be equivalent to a course or courses currently included in the LL.M. curriculum and (2) the student received at least a grade of "B" or the equivalent in the course. Applicants requesting such credit should so indicate when applying for admission and provide a syllabus or other description of the material covered in the course for which such transfer credit is sought. In no case will credit be given for extension or correspondence courses. In unusual cases, a student may petition the Director of the Program in order to request additional transfer credits. With the approval of the Director, a student may petition to receive up to twelve (12) credits toward the degree for LL.M. level courses or advanced J.D. level courses equivalent to courses currently in the LL.M. 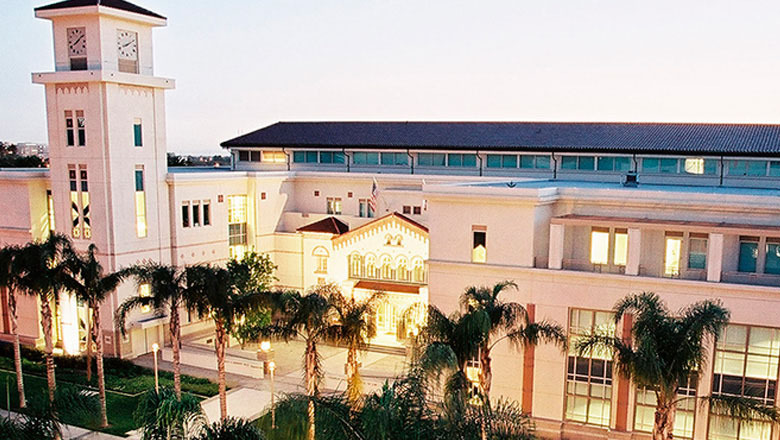 curriculum taken at Chapman University Fowler School of Law during the three academic years preceding matriculation into the Program and within five years of completing the Program, provided the student received at least a grade of "B" in the course for which credit is sought. With the prior approval of the Director and for good causes shown, a matriculated student may receive up to six (6) credits in the aggregate for LL.M. level courses taken at another ABA-accredited law school and courses taken in the Chapman University Fowler School of Law J.D. curriculum, provided the student receives at least a grade of "B" or the equivalent in each such course. There is no mandatory grading curve for LL.M. courses. Instructors in courses with both J.D. and LL.M. students will be asked to grade the two groups of students separately unless granted a waiver of the J.D. mandatory grading curve by the Associate Dean in accordance with existing rules. Tuition is charged at a per-unit rate in the LL.M. Programs at Fowler School of Law. This gives you the flexibility to complete the program at your own pace. All LL.M. programs require 24 units with the exception of Taxation, which is a 27 unit program. These units may be reduced by eligible transfer credit. You may request transfer credit for qualified law school coursework at the time you apply. LL.M. students are eligible for merit based scholarships that typically range from 10%-35% of tuition. Awards are made by the Admission Committee and students are notified at the time an offer of admission is extended. The law school faculty have identified the following learning outcomes as critical to a law degree and to developing the skills needed to become a proficient attorney. Understanding American Law – LL.M. students with foreign law degrees will demonstrate an understanding of the legal system of the United States by applying (1) the common law and case method, (2) basic principles of legal procedure, and (3) specific content areas relevant to their area of emphasis to propose, assess, justify, and/or recommend resolutions to simulated and real-world legal issues. Emphasis-Appropriate Content and Analysis – LL.M. students should demonstrate subject matter knowledge and information appropriate to their area of emphasis and their personal and program goals. Students should apply legal rules and information appropriate to their area of emphasis to formulate clear and effective legal analysis and to prepare and recommend solutions to legal problems. Emphasis-Appropriate Skills – LL.M. students should develop essential skills appropriate to their area of emphasis and their personal and program goals. -- For Trial Advocacy emphasis students, this primarily means skills appropriate to trial practice. -- For Business Law emphasis students, this primarily means practice-related legal research and writing, as well as skills such as Negotiation and Mediation for students with those focus areas. -- For International & Comparative emphasis students, this primarily means academic legal writing (Directed Research/Thesis). 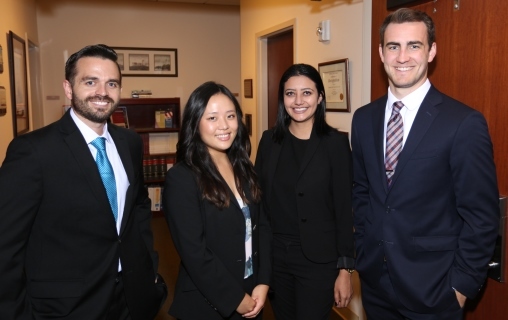 -- For Entertainment Emphasis students, it primarily means real-world negotiating and drafting media-related legal instruments via the Entertainment Law Clinic. -- For Tax emphasis students, this primarily means tax-related practice skills and legal research/writing. Complete this form to stay informed about our programs, important deadlines, & news. Please let us know if you have any questions. Chapman's LL.M. program draws high caliber students from around the globe.